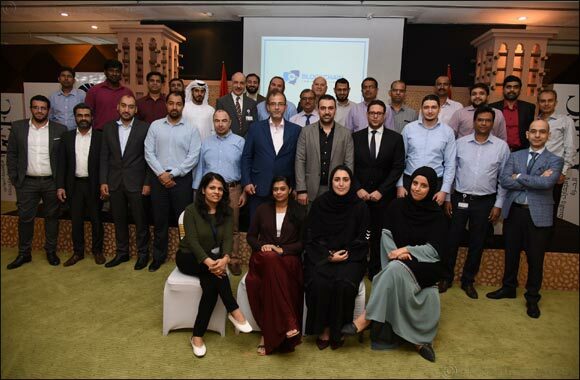 Dubai, UAE, November 04, 2018: Business Innovation Department in Dubai Customs organized a workshop for the employees on the blockchain technology in customs field. Renowned American blockchain expert Chris Benet, an influencer in blockchain and founder of Aenea company, the leading company in empowering growth with blockchain, took part in the 4-day workshop which saw the participation of 68 male and female employees from different departments in Dubai Customs. The workshop is part of Dubai Customs efforts to capitalize on the blockchain technology and support the Dubai Blockchain Strategy which will help Dubai achieve the vision of H.H. His Highness Sheikh Mohammed Bin Rashid Al Maktoum, Vice President, Prime Minister and Ruler of Dubai by making Dubai the first city fully powered by Blockchain by 2020 and making Dubai the happiest city on earth. Hussam Mohammed, Director of Business Innovation Department inaugurated the workshop. Chris Benet introduced the main applications and functions of blockchain technology and best means to invest this technology in customs and supply chain work. Benet enriched his lecture with examples of real scenarios and case studies. Hussam Mohammed said:” Dubai has positioned itself as a global city, attracting foreign trade and tourism and earning its place as an international business center. Dubai government’s blockchain strategy calls for the shift of all applicable transactions to blockchain by 2020”. He added: “Blockchain is like a new operating system for trust. It creates a single, shared version of the truth that no single entity owns or controls. This leads to increased trust and integrity in the flow of information among participants”.